Captain Scott, the skipper of the Middlesborough steamer Lochwood, which was torpedoed in the English Channel on Good Friday, is an East Boldon man. His mate was Mr Poulson, of South Shields, and the third engineer was Mr Ellis of Jarrow. These were the only local men out of a crew of 22. The skipper, interviewed at his home last night, where he had arrived earlier in the day looked and declared himself to be none the worse for one of his most exciting experiences in a career of 44 years. The Lochwood, with a carrying capacity of 3,500 tons and with a cargo of small coal on board, left Barry for France on Thursday afternoon. At that time the weather was calm and clear. All went well until some 23 miles sotuh-west of the start point, when a submarine was seen on the surface of the water about a mile away on t he port beam. After passing the Lizard, a strong south-westerly breeze was encountered, and the sea was rough. Realising that his boat, which could only do 7.5 knots per hour, had little chance against the submarine, the number of which was not distinguishable, Captain Scott put his stern on to it and ordered full speed ahead. Two men were at the wheel and he and the mate were on the bridge. A zi-zag course wa kept, but it was obvious that the Lochwood had no chance of escape. He was, however, determined to give the submarine a run. When it was about a third of a mile away, the first torpedo was fired. It was launched on the starboard side, and passed the ship at a good speed. He could only liken the torpedo to a porpoise. 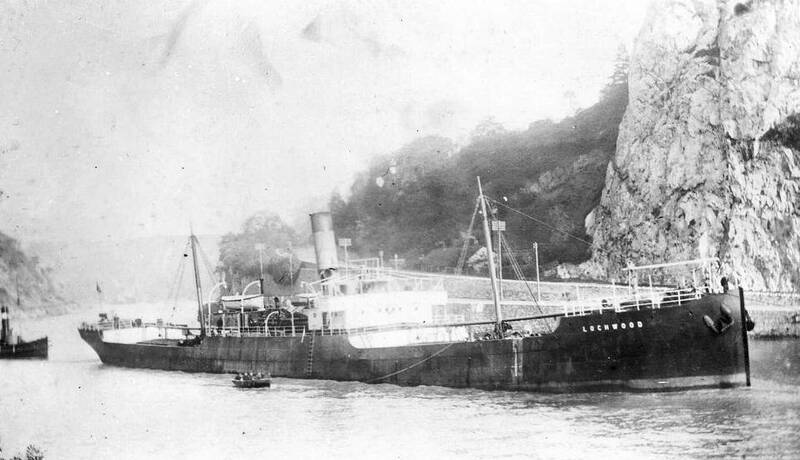 Meanwhile, the skipper observed that a trawler, which proved to be the Onward of Brixham, was following in the wake of the submarine, which continued gradually to overhaul the Lochwood. When only about four ship lengths divided the boat and the submarine, a second torpedo was launched, but the marksmanship was worse than on the first occasion, for the torpedo travelled fairly wide on the port side. Still keeping his boat zig-zagging at full speed, the skipper heard the commander of the submarine call out to stop. No notice was taken of the command, but it was repeated with the warning that the crew would have 10 minutes to get into their boat, for the Lochwood was to be sunk. Realising the futility of prolonging the struggle, the captain ordered the men to get into the boat, and just as it was lowered a third torpedo, fired at 50 yards range, struck the ship on the port side in the wake of No 3 hatch. The torpedo blew a great hole in the side of the ship and the hatches were blown away. A cloud of coal dust rose some 200 feet in the air. Meanwhile, the boat containing the crew had been launched, but it narrowly escaped being struck and had also a narrow escape from capsizing as a result of the concussion. After cruising around for an hour until the Lochwood sank from the stern, the submarine steered off in a westerly direction. The Onward by that time had caught up to the small boat containing the crew, and eventually took them on board, and afterwards they were transferred to a patrol boat, the chase lasted over an hour and a half. The submarine appeared to have guns on board, but owing to the heavy sea and the course steered by the Lochwood, no attempt was made to discharge them. News Article This article relating to one of the many adventures of Captain Scott who went on to be torpedoed a number of times during his long career. This sinking has been identified as being by SM U-24 of the Imperial German Navy.